I have had an advent calendar for as long as I can remember. 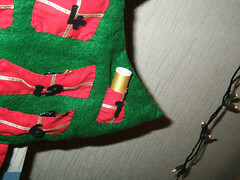 In fact, at a very young age (my parents think I was about 6 or 7) I made myself an advent calendar. And I have used it every year since. Himself had actually stolen my sweet this morning and replaced it - with a cotton reel!!! The sweet was later found hidden under my handbag. Wishing you all a very happy December 1st! What fun you must have in your home! So nice to have that advent all that time too. I would like to make one. It was a pattern I found in one of my mum's magazines (and quite possibly what started my obsession with Christmas magazines). I am keeping a close eye on it, waiting to see if it needs any repairs, but so far so good, impressive as it's nearly 30 years old. It will definitely get passed down the generation. How are your felt supplies in the Middle East? It's a very simple make. 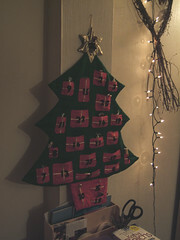 How awesome to have a tradition of using an advent calendar you made as a child! What a cool advent calendar. I am alas without one this year but intend to make lil one one next year out of baby socks.